Preble Shawnee’s Jenna Lovely helped the Arrows to an 18-5 record last year. She will play a key role for the Arrows again this season. 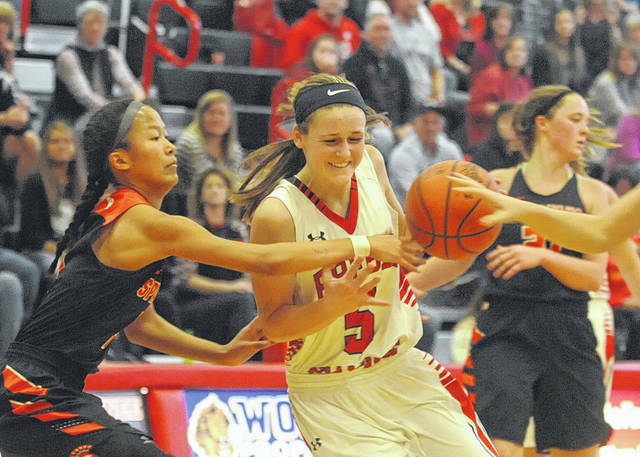 CAMDEN — Preble Shawnee’s girls basketball team returns all five starters from a team that went 18-6, finished second in the Southwestern Buckeye League and reached the sectional final. The Arrows are looking for the same success for the upcoming season. Shawnee has won 35 games over the past two seasons. Back for the Arrows are senior Nicole Sims, who will miss some time at the beginning of the season due to an ACL injury she suffered this past spring. She was a first-team all-league and District 15 last year. Senior Jenna Lovely is a three-year starter and first team all-league and District 15 performer. Senior Brenna Woodard is a three-year starter and first-team all-league performer. All three were double-digit scorers last year year. Also back are two-year starters Logan Hollon and Kaylie Campbell, in addition to Cami Hollon. The Arrows will be looking to replace the inside presence of Malorie Plaugher and Shelbie Brown, both of whom graduated last year. “(I expect to) compete for league. Meet or exceed last years 18 win season (and) win sectional,” Schaeffer said. Schaeffer said the division race will be tight among his team, Waynesville, Madison and Milton-Union. Shawnee will open the season on Monday, Nov. 26, at home, with Hamilton Badin. They will travel to Brookville on Thursday, Nov. 29 and close out the first week with a trip to Northridge on Saturday, Dec. 1.
https://www.registerherald.com/wp-content/uploads/sites/41/2018/11/web1_psgbk6.jpgPreble Shawnee’s Jenna Lovely helped the Arrows to an 18-5 record last year. She will play a key role for the Arrows again this season.